This dustpan is lightweight but durable and has a rubber lipped edge for picking up even small debris. The soft bristled handle comes with a hole for hanging away when not in use. 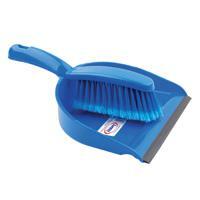 This blue set can be used as part of a colour-coding system to avoid cross-contamination.